Accepta 2591 is a broad spectrum non-oxidising biocide solution based on DBNPA for use in a range of applications such as cooling water, pulp and paper processing, metalworking fluids and the treatment of RO membranes. It is particularly rapid in its action and has an excellent environmental profile because it degrades quickly and naturally. Accepta 2591 will rapidly kill a wide range of bacteria including Legionella bacteria. At 100 ppm Legionella is killed in 2 hours. Accepta 2591 delivers a synergistic performance with halogen. Accepta 2591 also exhibits rapid breakdown (hydrolysis) to low toxicity end products. The rate of breakdown increases with temperature and pH. Fast acting, effective DBNPA based biocide. Breaks down to low toxicity end products. Suitable for a range of application. A good secondary biocide for systems treated with halogen. Composition: A solution of 2,2-dibromo-3-nitrilopropionamide in water and glycol. Accepta 2591 can be dosed by hand or through automatic dosing equipment. Accepta 2591 should be dosed intermittently at a rate of 50 – 200ml/m3 of system volume. The required frequency and exact dosage will be dependent on the microbial fouling of the system. 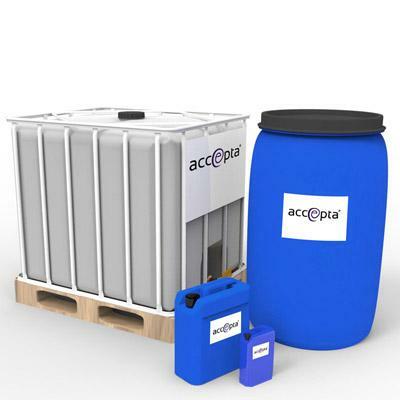 Accepta 2591 would normally be used at part of a total cooling treatment package incorporating another non-oxidising biocides and inhibitor to control scale and corrosion. A dosage to achieve of 50 – 200ml/m3 should be added based on the combined volume of the CIP tank and the membrane housings diluted with RO Permeate. Dose to the feedwater to the RO plant at a rate of 10 – 50ml/m3 for a period of at least 1 hour and repeated as required to restore performance and maintain the membranes. Testing – A DBNPA test kit is available in various formats from Accepta.